This seems like an opportune moment to publish this review, since I'm hoping to swing by a signing tomorrow at the Seattle Mystery Bookstore. This is extra fun because the contemporary part of the trilogy takes place in the same historic Pioneer Square neighborhood. I'm not sure why the stars aligned just right for me with this trilogy, but the first one caught my eye shortly before the third one came out, so I got to read them all pretty close together, which I think is really fun. Krentz has always been one of the really innovative authors in romance, in my opinion, and manages her career with the steely resolve of one of her contemporary Titans of Industry that were the popular Alpha Heroes of the late 90s (and still are, sometimes). She writes and writes and writes and rarely disappoints. 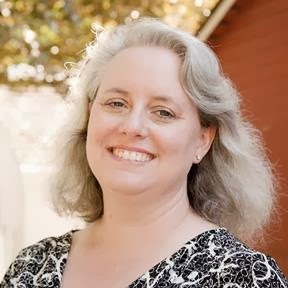 She writes historicals, contemporaries, and is one of the few and one of the first romance authors to venture into futuristic sci-fi romance. She started writing paranormal before "everyone" was doing it, with heroines who had mild paranormal powers (well, mild compared to say, turning into a werewolf or sprouting the wings of a guardian angel, or what have you). 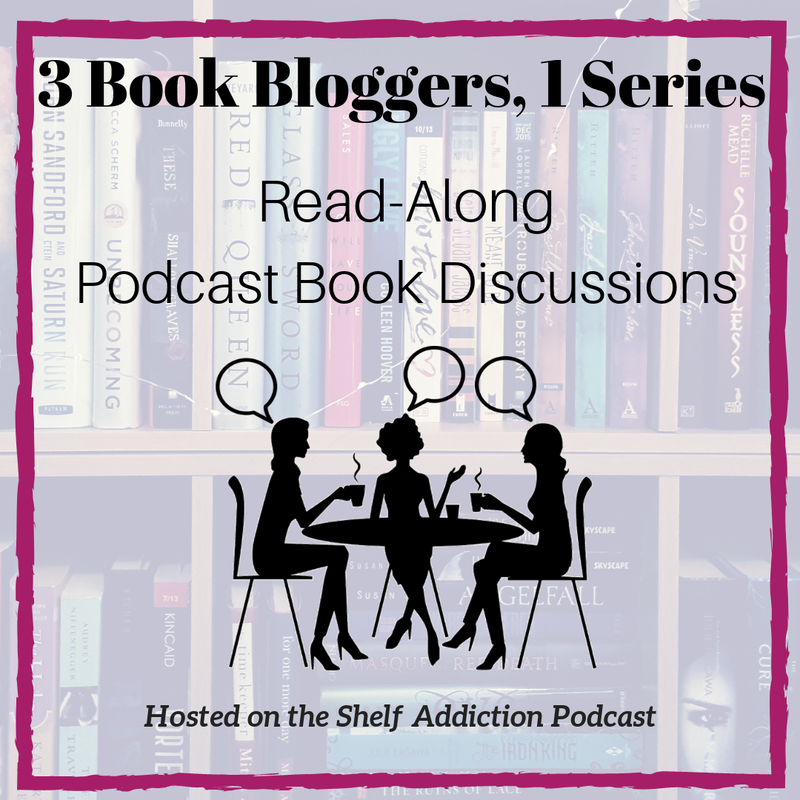 Her Arcane series is the first of its kind, as far as I know, that weaves back and forth among her three pen-names and corresponding three subgenres: Amanda Quick in historical, Jayne Ann Krentz in contemporary, and Jayne Castle in futuristic. 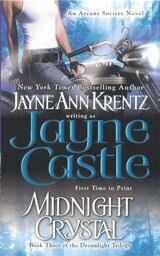 I think of her as Jayne Ann Krentz, and I believe that's her most successful persona, but her real name is Jayne Castle. I just can't think of her that way, heh. She's also something of a hero of mine for being among the first to point out the hypocrisy of critics who "worry" that romance readers are giving themselves false expectations of their own lovelives, while apparently having no concerns that readers of Steven King or Robert Ludlum will suddenly start attempting to solve outlandish murders outside the law or setting fires with their minds. If you haven't read Dangerous Men and Adventurous Women, you really should. Then, more recently, I heard her give this gem of a speech about the genre. So the Dreamlight Trilogy is a subset of the Arcane series, following the past, present, and future of an artifact of paranormal power. The futuristic one, Midnight Crystal, is the first Arcane book to also be a Harmony (set in the future on the planet Harmony) book, but it fits pretty seamlessly into the Harmony worldbuilding. How do I know that? Well, actually I've only read a novella from the Harmony books, other than this one, so maybe there are contradictions all over the place, but knowing Krentz, I doubt it. The paranormal elements of the two different worlds are nicely complimentary and work together just fine. 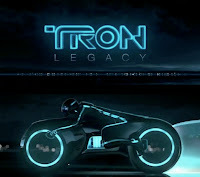 I can't say that Harmony is my favorite paranormal world -- it's a lot like 21st century earth, for reasons that are explained, down to email, cell phones, and motorcycles, powered by an eerie green grid. 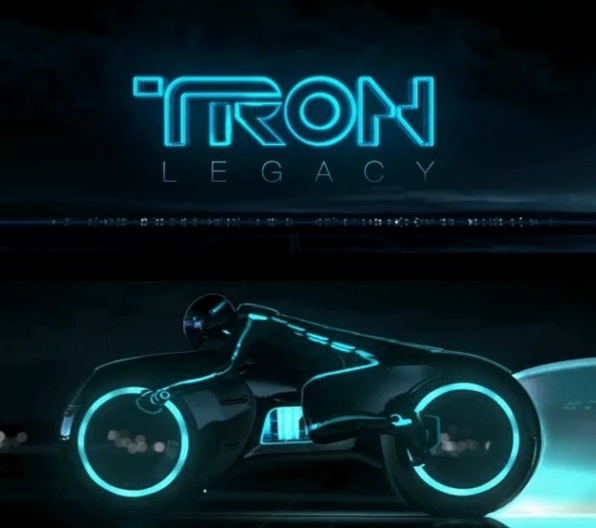 Sort of like Tron, I guess. It was interesting to read the trilogy all together. I'm not sure I've ever seen one done quite this way -- the plot for all three was pretty much exactly the same, but with very different settings and different villains, getting in the way for their own reasons. I enjoyed each book, but I'm not really sure how I feel about how very very similar the plots were, if that makes sense. I felt like the women characters were more differentiated than the heroes, but there were still a lot of similarities, especially between Chloe and Marlowe. I have to admit being completely charmed by Adelaide's sketchy backstory as a fortune teller in a Wild West show. I kind of wanted to read that book. One of the things I like about the Arcane world is how the paranormal powers are just known and accepted by the characters. While it's sort of the parallel, hidden world that's common in urban fantasy, there is less of the "no one must ever know!" undercurrent that you get with vampires and shifters; and even less of the fear that others will think they're crazy if they acknowledge or use their powers. That isn't bad in and of itself, but it can get tedious, so the matter-of-fact approach is really refreshing to me. I like that the h/h can just talk to each other about their talents without dancing around it for an extended near-big-mis. 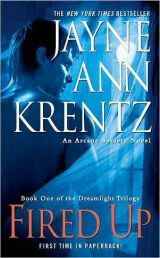 The Dreamlight Trilogy delivers Krentz's trademark fast pace and engaging characters. Read just the ones you want or all three, it will still work for you -- although I think the Midnight Crystal probably references the prior stories the most. I think the similarity of the stories is overall slightly disappointing, although in a way, it's an interesting experiment in exploring how setting matters. This might be a case where the sum isn't greater than the whole and the books might be more enjoyable on their own. ps, I have a post percolating on the plotting pitfalls of the paranormal proficiencies... but it would make this post too long.
" -- although I think the Midnight Crystal probably references the prior stories the most. I think the similarity of the stories is overall slightly disappointing,..."
Thanks. In hindsight this was the reason Midnight Crystal didn't work as well for me as the other Harmony books. I like the fact that Arcane psychic h/h pairs don't have to move through disrespect and abiding distrust to build a relationship, as is often the case in other paranormals. I just started the Looking Glass Trilogy. It'll be interesting to see if Canyon of Night, the Harmony entry due 8/30/11, can top Midnight Crystal. P.S. Like you, I wanted to know more about Adelaide. With MC, did you not like the references to the prior books, or was it the plot similarity? I'll probably wait for the Looking Glass books to go to paperback. I love all of these books and listen to them often. The whole Arcane/Harmony thing is neat. I guess they're my comfort reads (listens). You can see how she's growing as an author as you go through the early ones to now. Chloe and Marlowe are too perfect to me. Some of her earlier heroines were genuinely flawed - argumentative, stubborn, scrappy. The ones in the Dreamlight books aren't really, though. Isabella, in In Too Deep, had an interesting back story too. I can see the flaws in the similar plots, etc, but I'm still a fan. I saw the references and similarities as linked issues - the references to the prior books just highlighted the similarities between the stories. I would go back to double check my memory but MC was one of only a handful of Krentz/Quick/Castle books I've ever sold back. And I'm reading the new series from the library first...just in case. 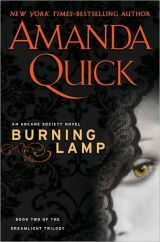 I'm reading Burning Lamp now. I also like the way she is bringing characters from other Arcane Society novels into this novel. When you run into her again ask her to write Adelaide's story. So far she's the most compelling Arcane Society heroine. Laura, do you mean the Wild West part of Adelaide's story? That was such a surprise to me when Adelaide mentioned it. There was another paranormal historical, possible one of Krentz', where the heroine was sort of a shady fortune-teller, IIRC. That was fun too.